A new study challenges the idea that the Nile valley was the only or even the most likely route out of sub-Saharan Africa for early modern humans. The leading author of the paper published in the prestigious journal Proceedings of the National Academy of Sciences, is Anne Osborne whose PhD research is supervised by Dr Derek Vance of Bristol University and co-supervised by Professor Eelco Rohling of the University of Southampton's School of Ocean and Earth Science, based at the National Oceanography Centre, Southampton. Today, the Sahara is one of the most inhospitable places on Earth and to cross it by foot would be a serious undertaking. Some 120,000 years ago, early modern humans faced this obstacle as they began to move 'out of Africa' and into the Near East. However, there is well-documented evidence for a strongly intensified African monsoon during the last interglacial (130,000-117,000 years ago), which also extended further north, reducing the south-north extent of the Sahara desert. This so-called 'greening of the Sahara' is caused by changes in the orbital configuration of the Earth around the Sun, which happen in recurrent 10,000 to 100,000 year cycles. 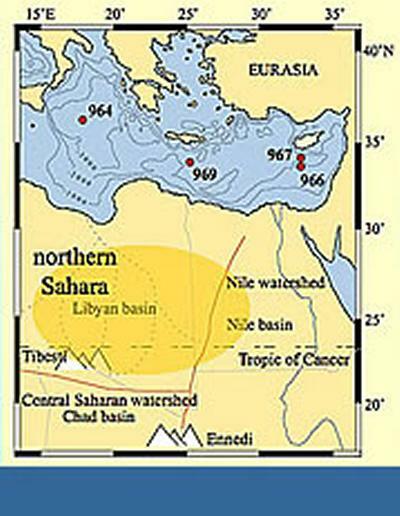 As part of ongoing investigations into the history of the Sahara, a team led by the University of Bristol and with collaborators from the National Oceanography Centre, Southampton, and the Universities of Oxford, Hull, and Tripoli (Libya) investigated whether the monsoon rains may have reached far enough north to pass the critical central Saharan watershed (at about 20-23ºN). Prompted by previous work that mapped ancient landforms in the Sahara, and Space Shuttle radar images that show fossil river channels across Libya, the researchers combine innovative use of the neodymium isotope ratio with stable oxygen isotope data from the Mediterranean, to trace the path of monsoon floodwaters. Erosion in the volcanic mountains that form the central Saharan watershed led to a characteristic neodymium isotope signature of the floodwaters. Osborne and colleagues were able to follow this signature to the Mediterranean using snail and microfossil shells from fossil riverbeds and Mediterranean marine sediments. The study shows, for the first time, that monsoon rains reached into the Libyan catchment basin, fuelling rivers that extended from the Saharan watershed to the Mediterranean Sea. These humid corridors rivalled the Nile Valley as potential routes for early modern human migrations to the Mediterranean shores. One of the researchers, Oxford archaeologist Nick Barton cites the similarities between Aterian and other Middle Stone Age artefacts in places like Chad and the Sudan, with those of Libya, as strongly supporting this theory: "We now need to focus archaeological fieldwork around the large drainage channels and palaeo-lakes to test these ideas." Prof Eelco Rohling of NOCS added: "This study proves that past 'greening of the Sahara' was more extensive than climate models suggest. The underlying processes remain to be fully explained, and the evidence forms a critical test for the next generation of regional climate models of the African monsoon." The paper "A humid corridor across the Sahara for the migration of modern humans out of Africa 120,000 years ago" is published on-line by Proceedings of the National Academy of Sciences (http://www.pnas.org/papbyrecent.shtml) on 13 October 2008. The authors are Ms Anne Osborne and Dr Derek Vance (both Bristol), Prof. Eelco Rohling (Southampton), Professor Nick Barton (Oxford), Dr Mike Rogerson (Hull), and Dr N Fello (Tripoli). Funding for the research has come from the UK'S Natural Environment Research Council.